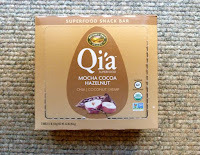 Today's Qi'a Mocha Cocoa Hazelnut Superfood Snack Bar was from Nature's Path Foods Inc (Blaine, WA). The family-run company offers other Qi'a snack bars, but most don't have cocoa in them. 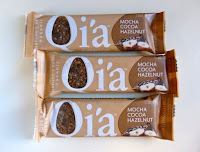 And in case you're wondering, chia, hemp and coconut are the three superfoods in this bar. 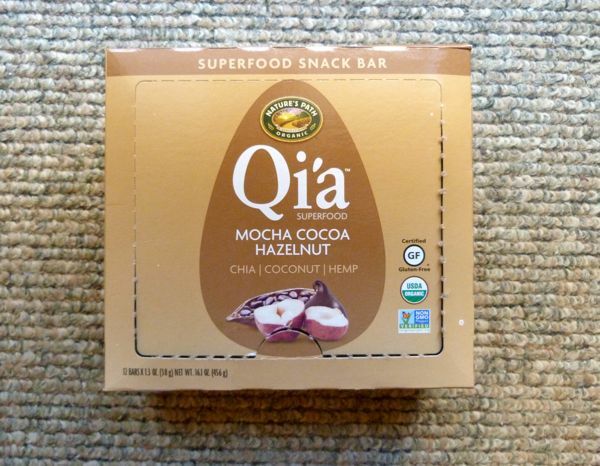 This Certified Gluten Free, Organic and Non-GMO Verified bar had a fruity aroma, and a pleasant, soft chew with texture from finely shredded coconut, tiny crunchy chia seeds and (visible) chunks of hazelnut. 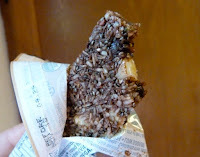 It held together nicely without the sugary glue sometimes used to bind and fuse snack bar ingredients. Extra points for that in my book. And much more likely to go into my hike backpack.